A boy and his box. Jack has never met a box he hasn't wanted to sit on. Although just who is more thankful? I am unwilling to hazard a guess. 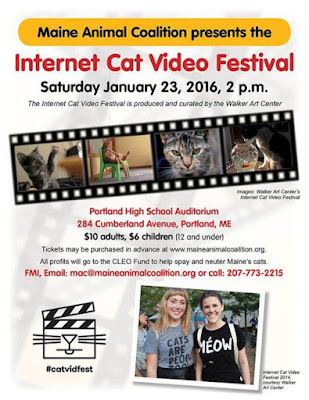 The Internet Cat Video Festival, produced and curated by the Walker Art Center of Minneapolis MN, recently came to Portland Maine. The screening was presented by the Maine Animal Coalition and all profits went to the Cleo Fund to help spay/neuter Maine's cats. Sister Steel Pan Band was playing which was pretty cool because they were playing pop music on steel drums. Hearing them play Michael Jackson's Thriller was an experience. The attendees are encouraged to dress as cats as there was an incentive of a gift for your kitty if you did. I wore my cat ears and was given a catnip toy. Informational tables on the spay neuter programs in Maine. The theater. It was three-quarters full by the time the show started. Introducing the video and discussion about the Cleo fund. There were a dozen or so videos that I hadn't seen before, mostly in categories of videos I wouldn't go out of my way to watch. I was a bit disappointed there wasn't 'more' going on. I would have liked to have seen a few vendors there selling clothing with cats on it or toys for cats, etc; but it was fun to go out and support the Cleo Fund and do so publically. I hope they do it again next year. On December 14th I introduced you to this little bundle of fluff.. He was thin and sickly, and he had a mustache and extra toes, and he was a welcome addition to Casa de Gato. I named him Gandalf because my husband picked the name. It worked for me, and it apparently is going to work for his new family as well. They came to meet him the day after Christmas. Seemed a complete and utter waste of time if you would have asked me, but seriously who doesn't want to play with kittens at Christmas time, and I was happy to do it. Yes, they fell in love. We had to wait for Gandalf to become healthy enough to be neutered, so he stayed here longer than we generally like to keep them. At a certain point in life, kittens get so bored with that room and spend most of their time trying to figure out how to get out of it. Gandalf was generally a good boy and didn't try to get out, but then again we already knew he was a little odd since he never really liked Happy Bear. We finally received the all clear and he was neutered, just in time for Jonah to come barreling down on the east coast. Fortunately, I was completely out of the brunt of it - and how weird was it being in Maine and not getting any snow while people in Virginia were slammed. However, Gandalf's new family lives in Boston and as such did have to worry about the snow. We weren't sure until almost the last minute if they were going to make the trek up. We knew they could get her safely enough, but would they make it home was the question. That morning the news seemed to indicate that they would, so I received a text that they were on their way. Gandalf attempted to pack his bags with all of his favorite things, but he wasn't having much success, so I helped. I packed some of the foods he had been eating since he was going on and off foods, along with a few of his favorite things. and maybe do a little quality control. and of course, we were late, when I arrived at the shelter they were already there waiting. They were so thrilled to see Gandalf again.. While I was sad to let him go.. more because I wouldn't have a kitten at Casa de Gato. I loved Gandalf, but he was taken for most of the time he was with me so it was easier to guard my heart. The family made it back home in time, so it all worked out perfectly. Now comes the hard part of the year, the time year when there just aren't kittens. Cats don't generally get amorous when it is freezing outside. Since the shelter is importing kittens from down south maybe we'll get some, but we will probably have to wait until March or April. February generally has held Former Foster Friday posts, and I bet I can convince a few of the adopters that I know of to share a few photos with me. Momma? What's in the box? Something for you and the other kitties. Yes, sweetie, all of you. Could you open it up then? WILL you open it for us? Not exactly, there is more in there than that.. not that a box of just paper wouldn't be awesome. Treats? these smell like cat treats? But why do they say DOG on them?!?!? Yes, they are treats, and yes they do say dog on them, but their ingredint list is so clean and you like them so much I couldn't resist when Chewy.com offered to send them to us for free as part of their blogger outreach program. Orijen makes really good treats I feel good about feeding to you because they have no plant based ingredients. I get the dog sized ones because you all seem to like chewing up the larger sizes and I don't risk you biting my fingers as I do when I feed you the smaller 'cat' treats. But cat or dog, the ingredient list is the same, and I like that. Yes, I do mind if you help yourself, remember, these are for everyone. Can we have more? Can we have them all? Yes, you can have more, no, you can't have them all, we are going to save some for later. Momma, do you know you say that every time? Do realize how many treats for later you actually have? I'm sorry guys. I didn't realize just how many half full bags of treats I did have. Is Later the name of some other cat, like maybe that one in that room we can't go in? No, later is some time after now, like after dinner or tomorrow. Since it is later, would you like us to eat those and help you empty out that treat cabinet? That is quite generous of you to offer... but I think if I just let you have at it, you would probably make yourselves sick. 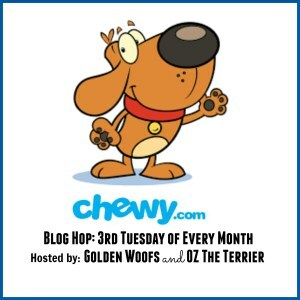 Momma, why is this blog post so late? Well handsome, it is because you kept sitting on me every time I sat down to blog and your "help" caused the post to be erased several times. I simply could not resist giving you kisses and cuddles instead of blogging... and now that you have wandered off to bug your dad for dinner, I have a chance to get this up. Thanks to Chewy.com for providing us all with some yummy treats to blog about. The questions were all from The Crew, the answers were all my own. Gandalf had a recheck appointment yesterday and he had to get a clean bill of health from the vets before they would sedate him. I brought in another stool sample and that too was negative for worms, and the exam showed signs of definite improvement. The vet called me to talk about his progress and I explained how he was doing better each day, how he still seemed to have throat irritation which produced a cough like sound which wasn't really a cough. She asked a few more questions and then said he still had some odd sounds in one lung, but she was comfortable clearing him for surgery, but it would be up to the vet doing the surgery. She went on to explain he would have some compromise of his lung for quite some time and that throughout his life he might be more prone to infections. I mentioned this to his new family and they are still very excited to adopt him. I finally got the call at 4 pm that he had been neutered and could I come and pick him up. I ran to the shelter to get him and brought him home. I told his new family that he is going to be good to go in a day or two. Sadly in a day or two, we are going to be in the middle of a blizzard, so there is a chance that he might not go home this weekend and if that happens he will be with us for another week. Oh the hardships I must endure. Gandalf is not a fan of sitting still, nor is he a fan of keeping his paws in one place. This is just three out of a huge number of out of focus photos in my attempt to share his feets with you. He's such a silly boy. Gandalf is still doing well. He has his finicky days when he won't eat anything I give him, and then he eats everything. It isn't a matter of the food because some food which was horrid one day is awesome the next. He still sounds like he has some post nasal drip or something going on as well. No idea if any of this matters in his upcoming surgery, but the vets will do a full exam on him prior to his appointment and they will decide if it is safe or not. I did take a stool sample in on Friday and he had his first clear results since we started testing him for lungworm which is a positive thing. I will take another sample in on Wednesday so they can test that as well. He is getting so bored in that room. He wants so much more, and I can't blame him, he's a growing boy and that room is designed for kittens younger than he is. I'm glad he will have another cat at his new home which will keep him entertained - hopefully, his new brother will like him and keep him in line. September of last year, Lisa of A Tonk's Tail, who works at Hallmark stumbled upon the results of a study on the type of content people enjoyed and trusted the most when online. Turns out we all love funny videos. But ranked #2 are the "cause" videos: those touching, thoughtful ones that tug at your heart, that rally like-minded people who believe in - well, a cause. I'd been working on a ton of video projects for work. And they were looking for more ideas. More ways to get the word out, to build awareness about Hallmark and our products. "We have this amazing partnership with Best Friends Animal Society to help find loving homes for shelter pets. One that is connected to our plush dog named Jingle, a homeless dog who found his boy. What if we reached out to people and asked them to share with us what their hopes and dreams are for the future of companion animals? What if that became a video?" I love it when my vocation and my avocation - my passion for helping homeless animals - align." She put forth the idea of creating a video about what pet people want and wish for in terms of animal welfare. A lot of people who heard about her idea wanted to contribute, as did I.
I sent in a few short videos of what I wished for in terms of cat care, that cats are no longer disposable, that they all find homes, and as a throw away - because the kitten I was fostering was sitting on Happy Bear - I recorded that I wished every cat could have their own Happy Bear. Almost fifty people joined in wanting to help and twenty people from all over the US and as far away as New Zealand sent in content. They set in text, audio recordings, photos and videos. The people featured in the video are bloggers, shelter volunteers, foster moms, shelter staff, animal transport network workers, police officers, musicians, artists and even a radio personality in Las Vegas. I am so glad that Hallmark decided to get behind this and I am so proud to have been a small part of it. I want everyone to see it. I want it to go from the third fastest orgainically shared video to Hallmark's #1 video. So watch, share, spread the word.. and hopefully more companies will step and and pick up the mantle of animal welfare and pet adoption and get the word out to even more people. Winter has hit hard here finally, and I have been so cold these past few days that I have made it a point to sit in my sauna and warm up. Doing so always reminds me of my Ollie, who absolutely loved sitting in my sauna with me.